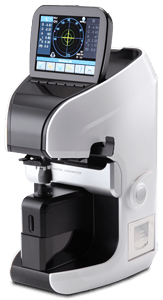 The OZMA CLM-9000 Digital Lensmeter offers accurate measurements of progressive lens. Feel the difference and provide patients with exact UV protection figure using the UV assessments. Take advantage of this high quality product at an affordable price. *Installation fee not included. Price valid for phone and online orders only. Call 1.800.Coburn1 to order or click “Buy Now” under Learn More. Shipping is free. Hartmann sensor with multiple measurement points guarantees reliability and stability. The auto adjustment of LED brightness depending on the detected the intensity on the sensor provides more accurate measurement of high diopter lens. New optical system with green LED (546nm, e-line) provides more accurate measurement result without Abbe value compensation. The newly designed PD Bar and Measurement nose can measure small, progressive or multi-focal glasses. In addition, the operator can still use the measurement nose when measuring the near sight addition.